The Sims Unleashed - A Sims's Best Friend or Unwanted Pet? 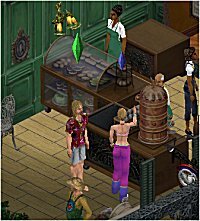 As soon as people were getting used to playing volleyball and being able to buy a bath with a shower fitting, true to form, Maxis went ahead and announced its next expansion with the title "The Sims: Unleashed". As this expansion pack has now been available for several months, I will not go through my usual rigmarole about the anticipation of waiting for it and having to scandisk and defragment my HDD before I was able to install it and how Amazon delivered it on time. Instead, I will cut to the chase and tell you that like most of the other expansions, it makes a major change to the way that we play the Sims. The first thing that you will notice once the game installs that Sim Lane is now part of a larger neighborhood of 40 houses and not all of these are residential. Sim Lane is now part of Old Town. The Goths are no longer the only family resident in your area. Mortimer Goth's father and mother are just one of the many families who live in this neighborhood. There are shops and parks in this area as well. For the player who loves to design lots, this is a very big change indeed. Before, if someone wanted to design a lot, they had to move a family in first and work on the design while they were in it. Now you can build on an uninhabited lot and edit an existing design without having to pay anything to do it. That mansion for No.1 Sim Lane can now be done. There is also more of interest. If a building is demolished, the land can be zoned for residential or community purposes. Have you got fed up of Bob & Betty Newbie at No.7? Why do I see a lot of nodding heads? Evict them, demolish their house, rezone the lot to "community" and turn it into a park, cafÃ©, store or anything that is covered by that category. I will look what you can build on Community Lots in more detail later. However, I will mention what I call the "Deja Vu Community Effect". You might have seen a similar effect when you have created a new neighborhood. You will have a copy of the original Downtown and the original Vacation Island (assuming you have the Hot Date and Vacation expansions). This was not usually a problem. Now the problem is magnified. Old Town is numbered from 1-10 and 50-80. All of the buildings and their residents from 50-80 are copied into each new neighborhood. That means that every neighborhood will have the Goth Snrs. and all of the other families who live in the community in each and every community and the same unoccupied buildings too. 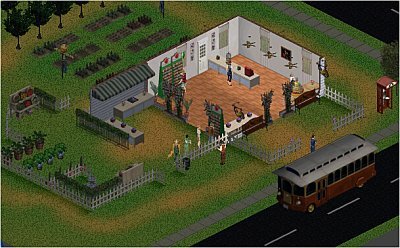 From the original game when you only had about a dozen characters, the last three expansions have increased the size of your neighborhood with townies, vacationers and animals to almost 100 characters. The more neighborhoods you have, the longer it takes to calculate the personality matrix and this increases your loading time immensely. Having the Goths living in one neighborhood was bad enough. To have Mortimer's parents and their cats living in every neighborhood is a nightmare. What? Didn't I mention that people can now have cats? This is the bread and butter of the expansion. Before this expansion, the only official pet that a family could have was a guinea pig and we all know the mixed blessing that was. All long-term players are bound to have lost a Sim or two to GPD. Now, however, you can go to an animal adoption center and buy a puppy or a kitten. Once a kitten or puppy is adopted, they become part of the family and have their own statistics and motive bars. Unlike a Sim, you cannot really control a pet. You cannot tell your kitten to go to its litter tray or tell a puppy to go and empty its bladder outside. The higher their skills, however, the more likely they are to be housetrained and obedient. The better trained your cat or dog, the higher the chance they have to win in a pet show. 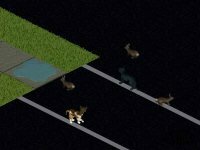 Cats and dogs - adopted or strays - in the game are very intelligent. They know how get into your house without needing a cat/dog flap, drink from your toilet and be a general nuisance. An option to install a dog or catflap in a door might have been more realistic and not much extra work. Cats and dogs are not the only pets. You can buy birds, fish, turtles and iguanas from pet stores. However, watch out for cats as they might try and eat your budgies once it is bored of killing mice. The other pets don't do much but you can improve your charm by talking to a parrot. Just don't overfeed it otherwise you'll end up with a polygon. Somehow, I don't think the most gifted orators in this world got to where they are by repeatedly saying "Polly wanna cracker?" Mind you, in this game a mayor is more important than a senator so who am I to now start questioning the system? Talking of careers, there are now five more. There are five new career tracks in the game. In the Culinary career track, you start as a dishwasher and work your way up to Candy Bar Magnate. There is at last a purpose in getting your Cooking skill instead of only getting it up to Level 3 in order that you don't set your cooker on fire. In the Circus career track, you start as a lowly popcorn vendor and work your way up to Ringmaster. So, if you have a Sim called Billy Smart or P.T.Barnum, this is the career track for them. In the Education career track, you can begin as playground monitor and become Minister of Education after stopping off as being a School principal called Seymour Skinner. For EstÃ©e Lauder, there is now a Fashion career track, starting as a clerk in a department store and finishing as being a Fashion Designer. The Animal Care career track starts you talking the local pooches for walkies and you should finish as an Animal Magician. To be honest, I'm not that impressed with these five additional tracks. The only purpose I can see in this is if someone is wanting to create new career tracks, there are now more to replace. Also, as there are more houses in the community, you can't really have two chiefs of police living only a couple of streets away. But I digress. There is more to the community than a few more houses. Community Lots come with new NPCs. There is W.C.Friendly, who is a jax saxophonist, Miss Estelle who will read your fortune if you cross her palm with simoleons and sometimes improve things instead of just taking your money; the Pet Trainer, who can train your pet quicker than you can but for a price; Gardener Bob; Tidy Heidi, who cleans up after the messy old towners and is a lot more attractive than Janitor Sonja from Downtown; Giuseppi Renni & Mr McCutch, the organ grinder and his monkey to name but a few. Community Lots are somewhere inbetween Downtown and Vacation lots. A similarity between all of them is that you order a vehicle to take you there - in this case, it is the Old Town Shuttle instead of a Taxi or SUV. So is Old Town like Downtown? Not quite. Old Town are really lots that have been zoned in that category. You could demolish a community lot, rezone it and turn it into the new home of the Newbies, assuming you hadn't deleted them from the family roster (darn it). Community Lots are similar to Downtown in that you can design shops, cafÃ©s and parks. You can add espresso bars and pastry stalls. Community Lots are similar to Vacation in that everyone has to be at home before you can go to Old Town and Fido has to come too. For a farmer, this is unrealistic. He might just want to pop down the shops to get some more seeds. Instead, he has to wait until his wife and children have got home and then call the shuttle to take them there. He gets his seeds, calls the shuttle and is then waiting ages for the family (including any cats and dogs) to gather. What? I forgot to mention gardening? Instead of automatically paying Â§5/snack, Â§10/meal and Â§20/group meal, you can now grow your own crops and either put them in your own larder or sell them at the garden suppliers. To illustrate this, here is Ramon Lascelles. You might remember him from other reviews like "The Sims De Luxe Edition - Must Buy or Must Boycott". Ramon wants to grow his own crops. In order to be able to do this, he firstly has to get seeds and these can be bought from a garden suppliers. Suppliers can be found anywhere from Old Town to even Vacation Island. Gardener Bob is usually hanging around, happy to give advice on growing crops and preventing them being destroyed. He can also sell you his "special stuff" which sometimes can give you a bumper crop or at other times wipe your crops out. Once he has bought his seeds and come back home, he needs to plant them in a "Dig for Victory plot". These can be found in the building menu and cost Â§75 per square metre. Over the next couple of days, he waters them and weeds them. The other problem is vermin. Gophers and rabbits are pests who go after your crops. Rabbits especially like your carrots. Scarecrows and windmills put off some vermin but not all. A well trained dog or cat is needed to help keep them away. You can make enough to live on from being a farmer but it is very hard work and tiring. 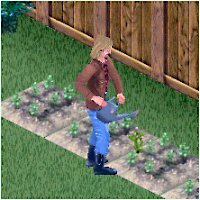 Although this does add a nice touch to your Sim's lives, there is no skill that influences how good your crops are which does make a hit-or-miss affair. Unleashed has taken my Sims to Hell. Even if you like jazz, having your Sims trapped for three days in the toilet at McArthur Park while W.C.Friendly plays his same repertoire again and again and again and again is a bit much. It is Hell because your Sims will NOT die in Old Town. My other Sims have been praying for a working gun rack so they can shoot the strays who have been soiling their lot. So is Unleashed the unwanted pet? Although I would not say it is man's best friend and like most expansions has its flaws, I like it and for the Sims fanatic who cannot live without their virtual people, I wholeheartedly recommend it and before long, they won't be able to live without their virtual pets. It adds a lot of new content, more walls, floors, objects and skins and the customisable neighborhood. If you can put up with cats, dogs and vermin messing up your crops and your lawn, you can put up with The Sims: Unleashed. It's worth it. Written at 00:21 on Thursday 16 January 2003 by Andy.